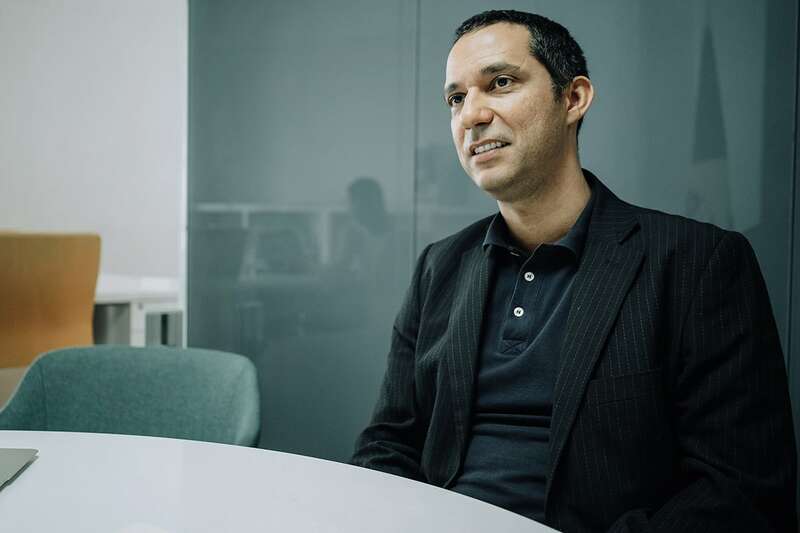 Gema’s General Director, Mauricio Alves, works with his multinational team in a house style defined by its indefinability. 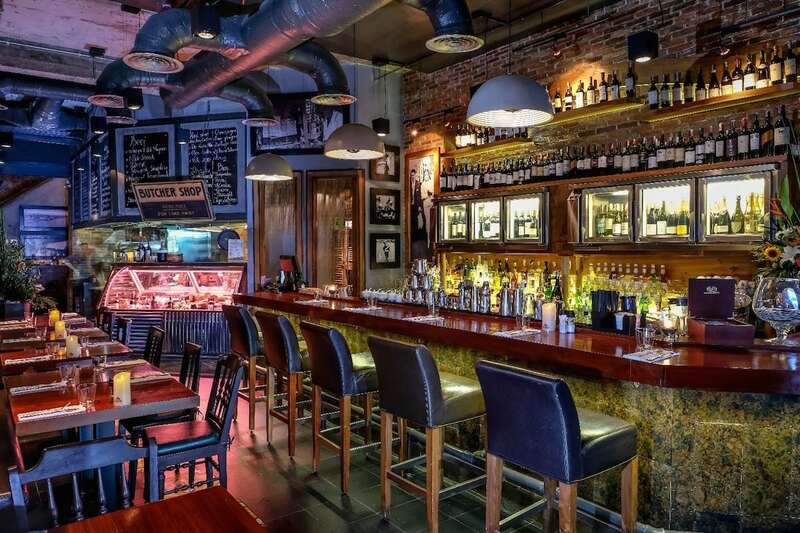 The architecture and interior design company were commissioned to design Le Club Bar at the historic Hanoi Sofitel Legend Metropole, NAMO’s artisanal Italian pizzeria, El Gaucho’s macho neo-industrial Argentinian steakhouses, and the Maharajah’s palace opulence of Tajmasago Indian restaurant among many others in their ten years as an architectural practice. We went to find the Sao Paulo-native, who is also Saigon’s Honorary Brazilian Consul, at his office hidden amid the cafes and boutiques in the 26 Ly Tu Trong corner building to understand the design philosophy that makes Gema Architecture unique. Let’s start with the name, Gema. “Gema” has many meanings. It means ‘“gemstone” and in Portuguese it’s also an acronym meaning “management, marketing, and architecture.” But the definition I prefer is that in Portuguese, “gema” also means “egg yolk,” words that are synonymous with the core or the essence of something. We have an expression, if I say “I’m Brazilian to the egg yolk,” it means I’m Brazilian to the core. And am I still Brazilian to the core? There’s a Brazilian poet, Carlos Drummond de Andrade, who said that from everything you do, remains something. I spent 33 years in Brazil before coming to Asia. I appreciate this multicultural environment, but those years in Sao Paulo defined me. How would you describe Gema Architecture’s style? We are like a chameleon. We don’t design what we want, we design what the client requires. I’d compare it to a chef tailoring their menu and pairing wine to a specific guest. Or like music, when you are fluent in the “language,” you can play any kind—rock and roll, country, pop, or bossa nova. Maybe it’s even like an actor interpreting a scene. Here in our office, we have five nationalities represented—Brazil, Vietnam, Italy, France, and Belgium. Each nationality will approach a problem in a different way. We draw upon that diversity when we are developing a concept. So, we designed the Indian-style Tajmasago in District seven and also Tandoor on Ngo Duc Khe; and El Gaucho, an Argentinian steakhouse—despite the fact I am Brazilian and I don’t eat meat! But to balance that, we designed the refurbished Rio Churrascaria on the corner of Le Thanh Ton and Thai Van Lung. 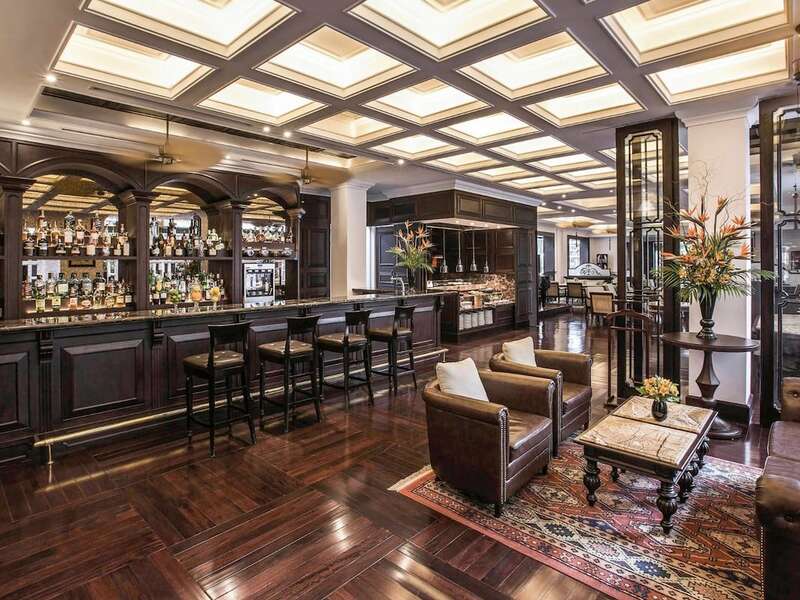 We did Le Club Bar at the Hanoi Sofitel Legend Metropole in a classic French 1920s style. 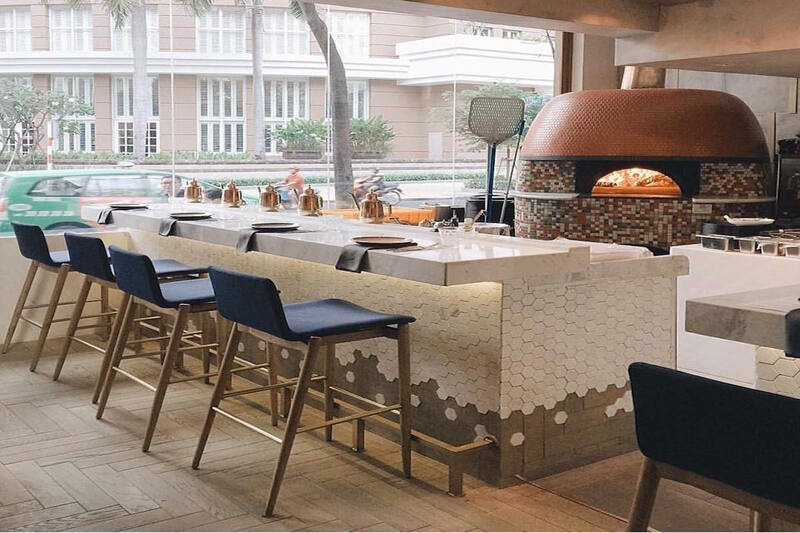 And there’s NAMO’s pizzeria, which is our minimalist take on contemporary-Italian restaurant design. 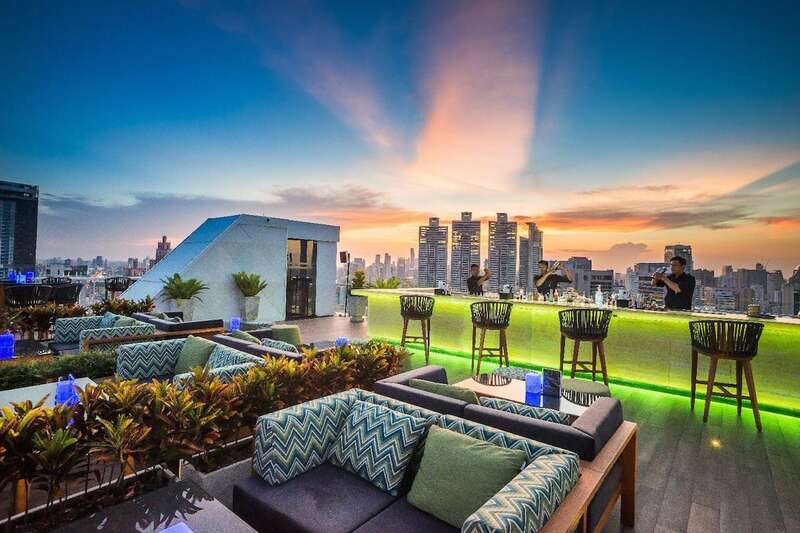 We also recently finished a rooftop sky bar in Bangkok, Vanilla Sky. Does engaging with such a wide range of projects mean your research takes much longer? Financially, we could be smarter. What makes money is replication. Our approach of treating each client’s project as unique isn’t the most profitable way we could work, but it’s one that we believe in. It’s also more satisfying despite being more time-consuming. A typical timeline for us would be one month to three months for a concept. How do you pinpoint exactly what a client needs? Design is a process but design is also the answer to a question. In fact, every profession can start with a question—for photographers, it’s how do you capture an image of this scene in the best way; for writers, it’s how can you describe a memory with words. And for designers, it’s the same. It’s also essential to identify the client’s requirements at the start. They might offer up a myriad of reference points—the Gothic style, butterflies, a poem. Then you see the space and understand the project from your perspective, and the question becomes how to reconcile those two things. Design is also something everyone can have an opinion about. Like Lao Tzu said, “care about what other people think and you will always be their prisoner.” Everything can be better, but everything can be worse too. Each project I complete is a small part of my twenty-five years in design and should be viewed that way. We do the best we possibly can, finish, then step back and reflect. Could you highlight some features of a local design, like NAMO’s or El Gaucho’s, that we might have missed? With every project, we try to provide a unique identity—features that could not be replicated anywhere else. At El Gaucho, there are customized metal panels and wooden elements that could only exist there. For NAMO, next to the window we have a two-ton showpiece pizza oven imported from Italy, a “Rolls Royce” of ovens, for which we had to reinforce the floor. Which are your personal favorite places to eat? I usually eat in this building on Ly Tu Trong, or I’ll walk to NAMO or El Gaucho. Recently, I have been going to Wrap & Roll—we designed seven of their restaurants. Of course, when I visit, I’m as focused on the design as the food. Is there one project you look back upon most proudly? Perhaps the Metropole because it’s a 117-year-old heritage hotel that’s welcomed guests like Charlie Chaplin and Somerset Maugham. At the same time the sky bar, Vanilla Sky, in Bangkok was a cool project to work on. I guess we always remember the most recent projects the most clearly. Today, for Gema Architecture and Interior Design, growth is not the question—it’s how to maintain our momentum while constantly striving for better and better quality. Over the one hundred plus projects we’ve done in more than ten years, we have planted lots of seeds. I am very happy that thousands of people go to the places that we designed. And it was an honor to work on projects like the Metropole and El Gaucho.